Intended to form a trail of embossed cast bronze relief “books” at Beaulieu in Chelmsford, the artist David Mackie has recently made his return to the local area with his latest project. The installation of the artwork took place early in August and the sensory seating blocks can be enjoyed along The Chase and in the newly opened Beaulieu Square. Mackie’s most recent venture worked in collaboration with children from local schools. The artwork is a celebration of Beaulieu’s character and lengthy relationship with the Tudors and by involving the local children, Mackie cleverly conflates Chelmsford’s past with its present and future. 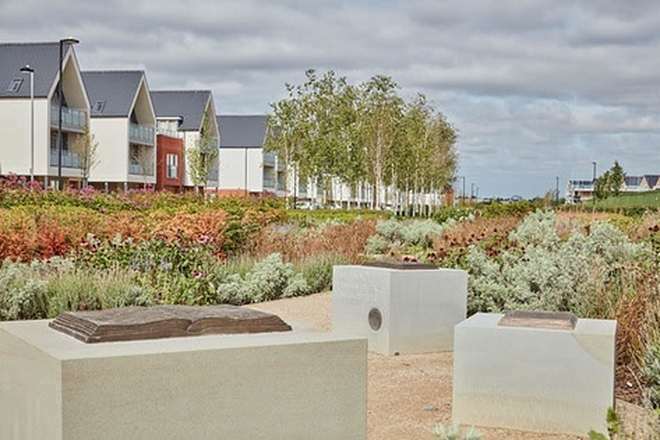 The artwork is dotted through Beaulieu’s central areas and is the latest addition of sculpture to the development. Based on themes taken from the royal inventory of books reputedly held in the library of the Beaulieu Palace in 1547, the project has taken inspiration from d Henry VIII’s ‘RuraliaCommoda’, a 700 year old guide to creating a formal garden. Artist, David Mackie comments: “It has been inspirational creating these timeless pieces of artwork that will remain permanently at Beaulieu, as reminders to all that pass by of the historical roots embedded into this development. I love working with children – their minds are not limited by age – they are free to imagine, to create and to inspire, which they certainly did that on this project and I thank each and every one of them. With the help of children from three of the local schools, New Hall, Springfield, and Bishops Primary Schools, the bronze ’books’ have been set into stone as perch seats situated within The Chase, the newly created park and gardens that run throughout the centre of the Beaulieu Chase neighbourhood and outside the Beaulieu Neighbourhood Centre. The ribbon of text included in the artworks is a specially commissioned poem by multi-award winning poet Tony Mitton. His poem uses the themes of love and home and relates these to the courtship of Anne Bolyen and Henry XVIII that took place in the grounds of the palace of New Hall. The poem uses the form of rhyming couplets and the Tudor love of puns. A line from each couplet is cut into each cube of stone, so the poem can be read in any direction as the reader perambulates the gardens. Beaulieu will provide a range of private and affordable tenures, to help meet the needs of the growing population. Within a 60-minute commute of London, with trains going in to Liverpool Street, Chelmsford is a popular residential location for those working in the capital. Set against the backdrop of extensive parkland, the homes at Beaulieu are arranged in a series of individually designed neighbourhoods, each with its own character, but all benefitting from an excellent range of amenities, transport connections, new schools and infrastructure that will make this a thriving place to live. A wide variety of homes are available from traditional family houses to contemporary apartments. To find out more, visit: www.beaulieu.uk.com.